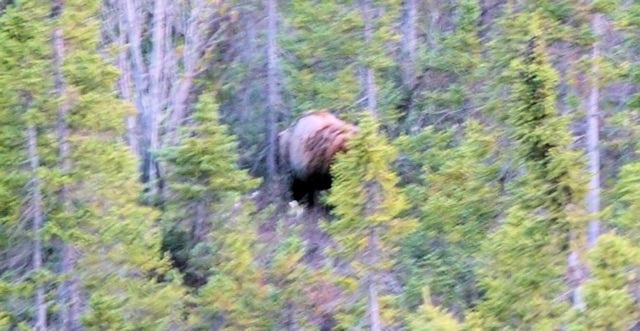 Jack had an unusual wildlife sighting the other day on the Richardson Highway (the road that connects Fairbanks to Valdez). A grizzly bear crossed the road in front him, so Jack pulled over for a possible photo since the bear was now on the left side of the road and easy to see from the driver’s side. 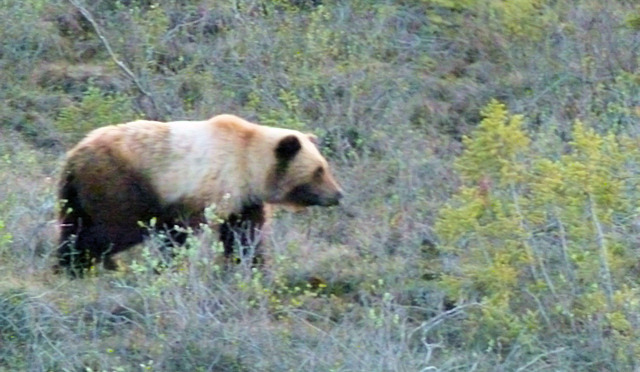 As soon as he snapped the photo of the bear, a wolf stood up out of the brush and trotted off, away from the bear. Then the bear turned around and followed the wolf into the woods. It’s pretty rare to see a wolf by the road, much less a bear and wolf in such close proximity. Was the bear following the scent of the wolf? Was the wolf injured? Unfortunately, we’ll never know. This entry was posted in Wildlife and tagged alaska, animal, animals, bear, environment, grizzly, highway, mammal, nature, north, predator, road, truck, trucking, wolf. Alaska is great Colin, just make sure you visit in the summer. That’s so cool. Thank you for this blog. It’s great to see Jack back on IRT and this season is really great.its good that IRT is going back to the old ways of showing truckers driving on ice. I hope there is another season and it keeps going back to the way the show used to be. More driving and less scripting. I love IRT and your blog. Thank you very much Evon! My husband and I are planning a trip to Alaska next year. What month would you suggest is the best to come?